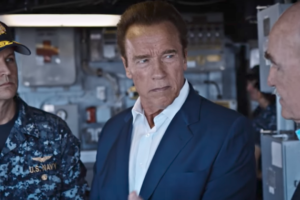 Arnold Schwarzenegger and the U.S. military have at least one thing in common: they’re both worried about climate change. The actor and former Republican governor of California recently visited Naval Station Norfolk, the largest naval base in the world, to see how it’s under threat from climate change. The Arnold has never shied away from his opinions about climate change. “I don’t give a damn if you believe in climate change,” Schwarzenegger wrote on Facebook in 2015. Neither have the U.S. military’s top brass been shy. In fact, American military leaders have been warning about the threat of climate change to U.S. national security since at least 2003. “Governor, [Naval Station Norfolk] is the second most vulnerable area, next to New Orleans, in terms of the sea level rise,” Rear Adm. Jack Scorby told Schwarzenegger. “Right now, our best estimate is approximately a two-foot rise by the year 2050,” the admiral said. And perhaps the biggest problem, Assistant Navy Secretary Dennis McGinn told Schwarzenegger, are storms. They “can increase sea level rise by four, five, six or more feet,” he said. Older Post“Crude oil tanker moratorium on British Columbia’s north coast”: Canada’s Minister Of Transportation.